Abstract: A new translation of the New Testament by Thomas A. Wayment, a professor of Classics at Brigham Young University, offers Latter‑day Saints a fresh look at this volume of scripture. Accompanying the translation are study notes that touch on historical, textual, and other items of importance in any critical reading of the New Testament. Wayment’s new edition should prove a helpful aid to Latter‑day Saint readers wishing to get more out of their study of the New Testament. 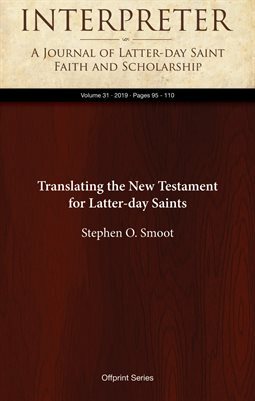 Review of Thomas A. Wayment, trans., The New Testament: A Translation for Latter‑day Saints: A Study Bible (Provo, UT: Religious Studies Center, Brigham Young University / Salt Lake City: Deseret Book, 2018). 491 pp. $29.99 (paperback).